I never finished writing about the last weekend of last summer. I still haven’t. Here’s the mea culpa, which is Latin for lame explanation. The events of the weekend have always been clear: we flew back to Iowa and met my sister to celebrate my mom’s 60th birthday. The weather was changing from summer to fall, Charlotte was about to turn 3, and mom’s diagnosis was still closer than it appeared. The trip was heart-wrenching and illuminating and (honestly) fun. So, I set out to write about it like I usually do, but it didn’t feel right. I deleted big chunks, started sections over. I used a trick that has always worked—I walked away from it, first for weeks, then months. I came back to it more determined than ever. I pulled all of life’s vast phenomena off the shelf, trying to find one that fit: time’s inexorable march, autumn’s splendor, memory in the age of digitization. Once plate tectonics appeared, though, I knew I had lost the plot. 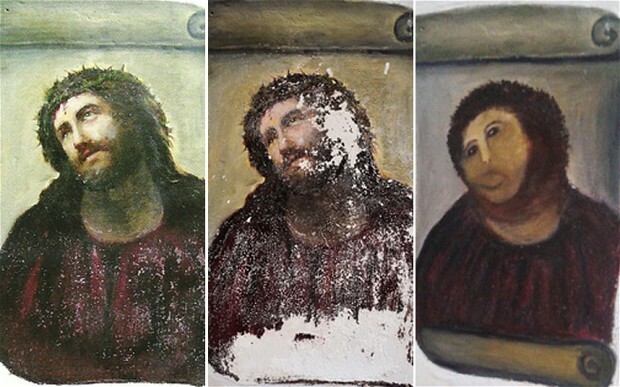 I had written the blogging equivalent of Ecce Homo, the 19th-century fresco restored lovingly and awfully by an old blind lady. My weekend bore little resemblance to the original. I’ve come to accept that blog posts (and fresco restorations) just take time, no matter how much you work ’em over. This one might need years of hindsight before anything appears 20/20. So before I get started on the third year of 13 Weekends, I’m putting this here as a placeholder, as a way of moving on without actually moving on. This explanation, along with Jesus’s silent, smudgy howl, will serve as a reminder that some weekends just take time.